Didn't realize that you could see me taking this shot. I thought my fingers were leaves!! It's been a very happy series! I wondered if you had captured a frog! Yes, I did enjoy them. This may be my favorite. I really enjoyed them, Margo. Such a creative, colorful shot! Fav. Lovely shot Margaret!! Like the selfie. This is a fun way of photography. haha unintended self portrait! 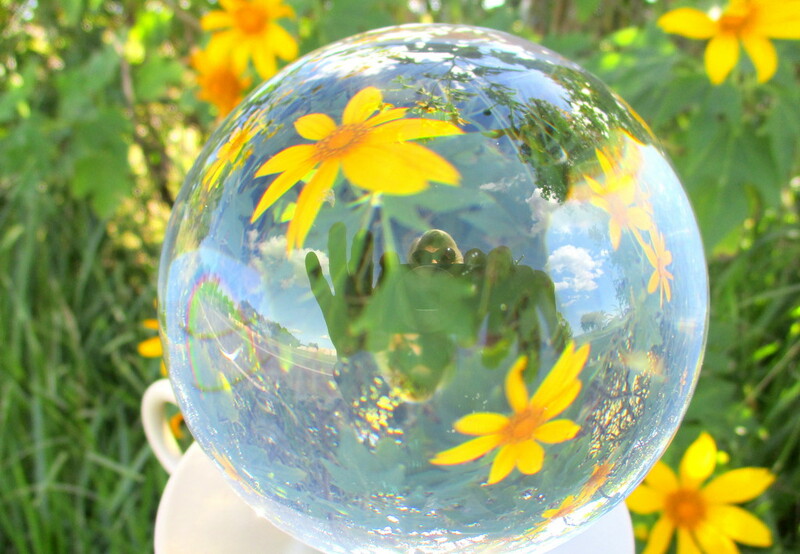 I love your crystal ball photos. The daisies are growing to harvest the seeds. The farmer will be payed for it by the seed compagny. I found at least 4 fields of them in that area. Another lovely shot with the ball. You are very good at this. I can see you!!!! Great shot! @onewing @fayefaye Thankyou both I haven't practised for a long time Hope to do a few more. BUT where? I can see you in this shot - hehe, a selfie! I bought a ball for taking pics years ago but never took any...yours are gorgeous, I really must have a good! @plainjaneandnononsense Oh!! You must get it out. find a stand(I used a tall candle holder & cut the pin off). Stick the ball on with bluetak. I took a tall stool with me & a heavy round meat board to stand it on. Then find yourself a subject. (I cant bend down very well that's why I used a high stool Good luck!! its fun.. Everyone stares at you, but just ignore that!! Oh how fun! I was trying to do this with my Daffodils this year and failed miserably! And I love that you included your reflection. @777margo ooh thank you for your advice, I'd not even got as far as thinking of a stand! Might have a go in my garden first before I go public, doing 365 definitely involves getting over people looking at you strangely!